Recently, as I was interpreting some testing results with a missionary, he expressed confusion about the feedback that he was high on empathy and low on compassion. He wasn’t sure that was even possible. I pointed out that probably the best description of his attitude in interpersonal relationships was that he often knows how others are feeling, but for the most part he really doesn’t care. He looked shocked and then admitted that was a good description of how he relates to people. Even though he often understands others’ thoughts and feelings, at the end of the day, that knowledge doesn’t move him to benevolence or action on their behalf. As a young counseling student in the early 1980’s I struggled to keep empathy and sympathy straight in my mind. They seemed so similar. I understood that accurate empathy was one of the non-negotiables of a good therapist. The ability to put myself into another’s shoes and participate in his/her feelings was imperative to formulating an appropriate response. For a long time, I erroneously thought that empathy involved determining how I would feel if I were in the person’s situation. Wrong. True empathy involves knowing how others are feeling and then experiencing or relating to their (as opposed to my) feelings. For example, when someone describes a sense of loss and sorrow about the death of a beloved pet, I enter the feeling via comparable grief over losses in my life. My upbringing on a cattle ranch has left me a bit callus to the comings and goings of animals but I have experienced enough other significant losses to access a measure of accurate empathy. From that empathetic connection I can give a proportionate sympathetic and caring response. Empathy is a must for counselors but it is also vital in all human relationships. Lack of empathy is a serious character deficit found in all personality disorders. People who cannot understand or appreciate another’s internal experience are severely limited in making basic human connections. Low empathy people are usually insensitive and unresponsive to people close to them. “I do not know or want to know how you feel” is a devastating condition in any friendship or marriage. 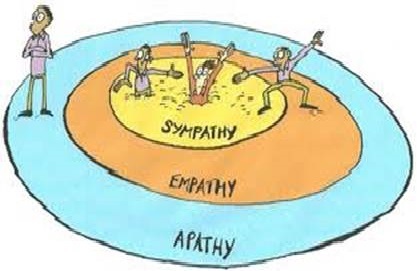 All relationally competent people exist on the high end of both empathy and sympathy. On the other hand, low empathy and sympathy people tend to have few meaningful intimate relationships. One encouraging aspect of our relationship with Christ is that He has high in empathy and sympathy toward us. Hebrews 4:15 says, “For we do not have a high priest who is unable to empathize with our weaknesses, but we have one who has been tempted in every way, just as we are–yet He did not sin.” This truth gives us confidence in our prayers since we are assured that He knows how we feel and He truly does care. That’s good news. I believe the bigger issue in relating to the Lord involves our lack of empathy toward Him. Remember: Empathy and sympathy in relationship is not a one way street. Generally, we do not make great efforts to understand God’s feelings or thoughts as we formulate a response to Him. We are so busy demanding evidence that He cares about our feelings that we don’t even consider His heart. Shallow and distant interactions with Christ are typically characterized by an unrelenting insistence on absolute empathy and sympathy from Him with no obligation to extend the same in return. Where He is coming from is not an unknowable mystery. God has published His feelings and thoughts in writing. Our lack of interest and responsiveness to His heart betrays our low empathy and sympathy to the One who gave Himself for our eternal salvation. Our response to Him is not an act of pity. Rather it is simply a reasonable answer to “getting” someone we claim to love. Well, folks…it is fortnight. Let us rejoice and be glad in it. I absolutely empathize with you in that emotion. Go out and have a good one.